Do you have a quiet room you go to when you want to think things through? Well, we have the right wall quotes for you! 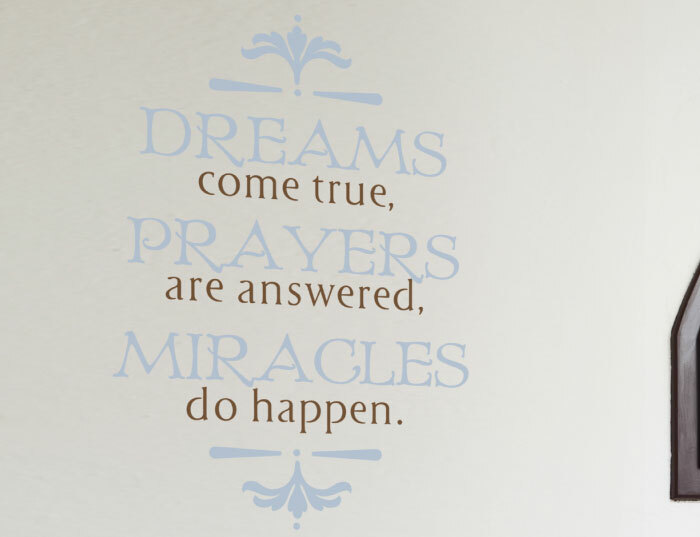 ‘Dreams come true, prayers are answered, and miracles do happen ’wall letters transformed this spot to an eye catching encouraging ‘centre’! They look great on the white underlying wall. The contrast makes it easy to spot them. 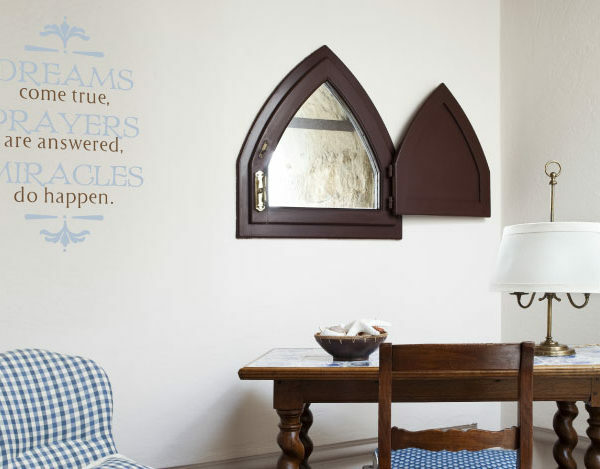 The two-colored wall lettering and its art is stylish and gives this room some elegance. It will be easy to pray while in this room! 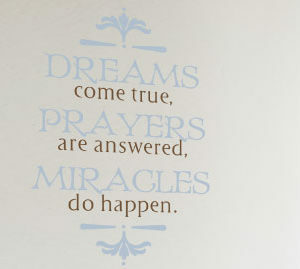 Are you looking for inspirational wall decor? Look no more: try DecorativeLettering products! Have a look at our ‘By room’ category. You will be pleasantly surprised by what we have available. Placing an order is easy on our user-friendly website. Make sure that you use our previewer to confirm that you have made the right choices for your wall space. 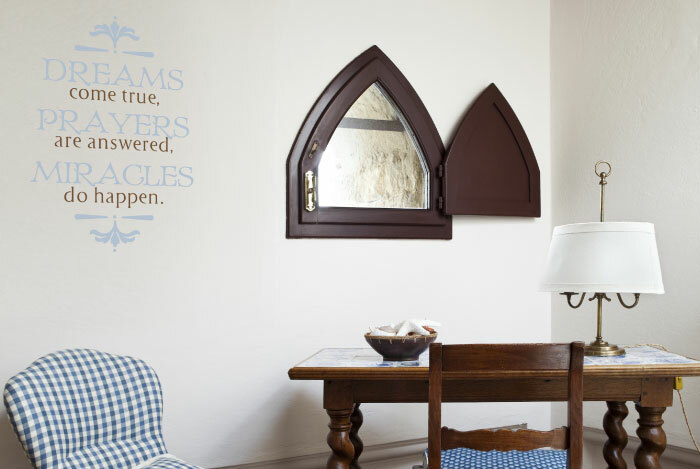 You will appreciate the inspiring wall letters every time you look at them! 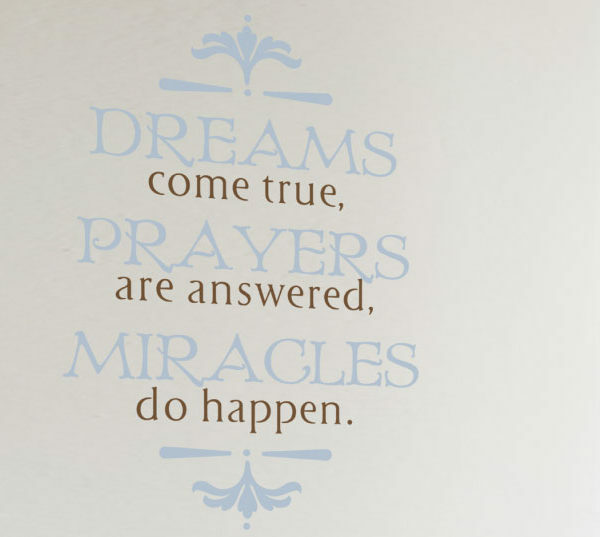 Our wall decals are affordable and a creative way to decorate the walls in your home. They are also heat and cold resistant. That means that you will be able to enjoy them all year round! Do you live overseas or abroad? Do not worry. We ship worldwide. You too can enjoy our unique wall products. Give us a call: we would love to hear from you! Let us help you decorate with stylish wall decor that will help you stay focused!